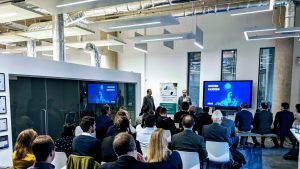 Bristol is ripe and ready to serve its tech-hungry community a big piece of blockchain, and on February 14th we were lucky enough to host to three exciting speakers who are bringing blockchain to life. 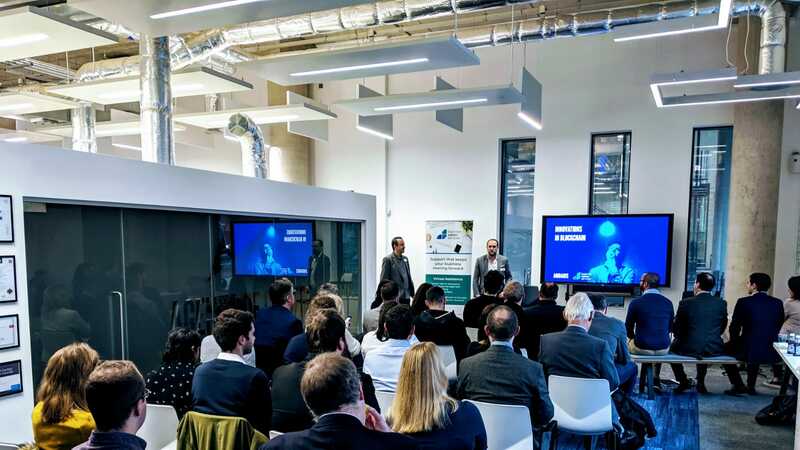 Working with Boatman Admin Services we, at Amdaris, hosted an insightful morning of short but sweet talks that showed how blockchain can bring real business value. There are a number of misconceptions when it comes to blockchain – that it only applies to Bitcoin or Cryptocurrecny and that it’s a highly complicated technology to understand – but these myths were dispelled when the wonderful people of Cosound, TokenMarket and DOVU shed some light on the topic. We welcomed dream team of the UK’s number one crypto and blockchain podcast, Ben Rees and Kevin Basham of cryptopulse.co.uk, who have also founded exciting new project, Cosound. Cosound is a cutting-edge social media platform, which houses a peer-to-peer marketplace for the music industry. The grand vision for the platform is a desire to become a new age record label, offering advances and micro-advances to musicians, management companies and labels through the platform. The exciting new project is using blockchain in a way that is truly valuable to both artists and their fan base. It will enable the protection of intellectual property through the use of smart contracts on the blockchain. Further to this, Cosound will have a tokenised reward scheme, which will drive user adoption and engagement. For a lot of businesses, they have nailed the sign-up process, but don’t continue to drive user engagement. By rewarding users through the use of tokens, the platform will not only be driving the use of blockchain technology but also empowering the userbase. The second speaker we welcomed to the floor was Ryan Hanley of TokenMarket. TokenMarket received confirmation that it would join cohort 4 of the FCA Regulatory Sandbox to test and measure the implementation and the practice of tokenising equity in the UK. They are working alongside fellow presenter, DOVU, on one of the UK’s first regulated security token offerings or tokenised equity fund raisers. Dovetailing TokenMarket, we welcome DOVU to our Arena to demonstrate how they are using blockchain powered mobility. You earn DOV tokens for sharing your mobility data or making small but important changes to your travel behaviour. You can spend your earned tokens or even create your own tokenised mobility service with seamless peer-to-peer transfers between DOVU wallets. DOVU explained how they will be one of the first companies in the UK to allow individuals to purchase tokenised equity in their company via one of the first FCA regulated security token offerings (STOs). They will do this with the help of TokenMarket, who they chose to host and manage this sale, as they are well-known global market leaders in the field. If you managed to come along to our breakfast event, we’re sure you enjoyed the talks nearly as much as the coffee and bacon rolls. If you’d like to find out more about our future events, you can be added to our mailing list. Keep an eye out for events coming up and drop us an email at marketing@amdaris.com if you’d like to attend or even speak.